In the Hooke's Law and Conservation of Energy experiment, students investigate the spring constant of a launching mechanism and use the information to determine its landing position. The provided spring launcher, featuring a pull handle, can attach to spring scales. Different masses can also be hung from it. The metric scale on the tube allows students to measure the displacement of the spring from the equilibrium position. Once the spring constant and stored potential energy of the spring is determined, students can use conservation of energy to determine its landing position. Ordering information: This kit includes a spring launcher, wood, plastic ball, catch cup, and 20n spring scale. A triple beam balance and meter stick is required but not provided. 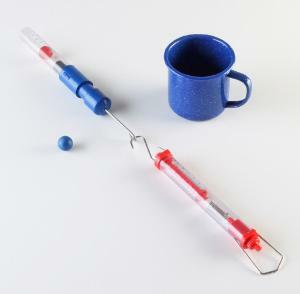 A hooked mass can be used instead of a spring scale.